A strong cold front that will move across the area late tonight and early Monday could bring with it a threat of severe thunderstorms. 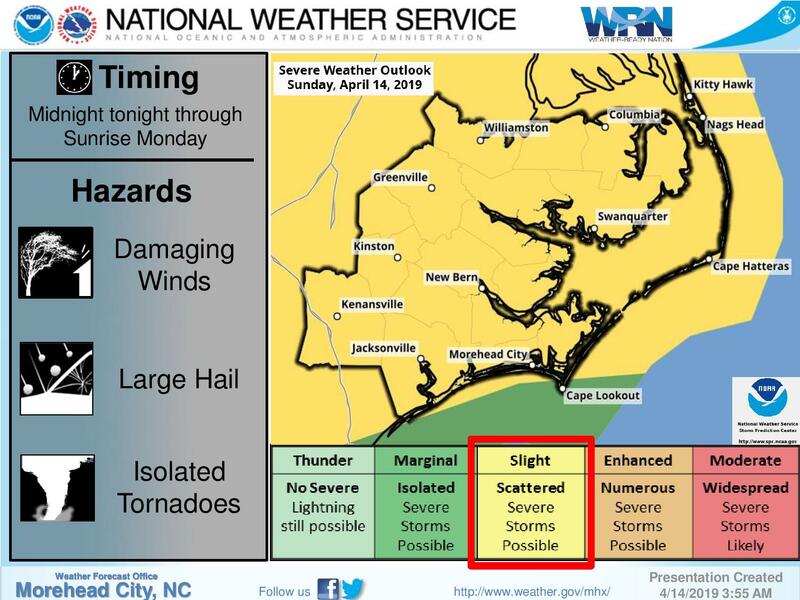 “Confidence is increasing that a line of thunderstorms will cross the area tonight,” said forecaster Carl Barnes with the National Weather Service office in Newport/Morehead City. “Some storms could produce damaging winds and large hail. An isolated tornado or two is possible as well,” Barnes said. A cold front that was stalled to the west brought off-and-on showers to the Outer Banks for much of Saturday. A few isolated showers are possible under mostly cloudy skies today, with high temperatures approaching 80. Strong low pressure will lift northwest of the area Sunday and Sunday night, pushing a cold front through the region Monday. High pressure will build in Tuesday and move offshore Wednesday before another potentially strong front approaches the area at the end of the week. Today: A slight chance of showers before 3pm. Patchy fog between noon and 1pm. Otherwise, mostly cloudy, with a high near 78. South wind 8 to 14 mph. Chance of precipitation is 20%. Tonight: A chance of showers and thunderstorms, then showers and possibly a thunderstorm after 3am. Some of the storms could produce gusty winds. Low around 63. Breezy, with a south wind 18 to 24 mph, with gusts as high as 30 mph. Chance of precipitation is 80%. New rainfall amounts between a tenth and quarter of an inch, except higher amounts possible in thunderstorms. Monday: Showers and possibly a thunderstorm before 9am, then a chance of showers and thunderstorms between 9am and 1pm. High near 68. Breezy, with a west wind around 21 mph, with gusts as high as 33 mph. Chance of precipitation is 80%. New rainfall amounts between a tenth and quarter of an inch, except higher amounts possible in thunderstorms. Monday Night: Clear, with a low around 48. Breezy, with a northwest wind 20 to 22 mph, with gusts as high as 34 mph. Tuesday: Sunny, with a high near 61. Northwest wind 11 to 16 mph decreasing to 5 to 10 mph in the afternoon. Winds could gust as high as 20 mph. Tuesday Night: Clear, with a low around 55. Wednesday: Sunny, with a high near 70. Thursday: Mostly sunny, with a high near 73. Friday: A chance of showers and thunderstorms. Mostly cloudy, with a high near 71. Breezy. Chance of precipitation is 40%. Friday Night: A chance of showers and thunderstorms. Mostly cloudy, with a low around 62. Breezy. Chance of precipitation is 50%. Saturday: A chance of showers and thunderstorms. Cloudy, with a high near 68. Chance of precipitation is 50%.